Attic Ladder (Wooden Basic) LWN 25x54 250 lbs 10 ft 1 in The ANSI approved LWN attic ladder is made from quality pinewood assembled in three sections. The LWN is equipped with a string to pull down the ladder. Length of ladder may be adjusted within 1 inch after cutting the side rails to set ladder evenly on floor. Construction of ladder provides more steps (tread rise about 10 inches) to improve safety and comfort. A red, metal handrail is available for purchase and may be added on either or both sides of the ladder to increase safety and comfort. Ample space between ladder and attic door for comfort and safety. Springs are located parallel to the door making entry to attic wider and more comfortable (the widest entrance on market - compare to other products). Door is well balanced - it opens and closes easily (NO sudden movements). Fits in rough opening 25 in. x 54 in. and ceiling heights 7 ft. 11 in. to 10 ft. 1 in. 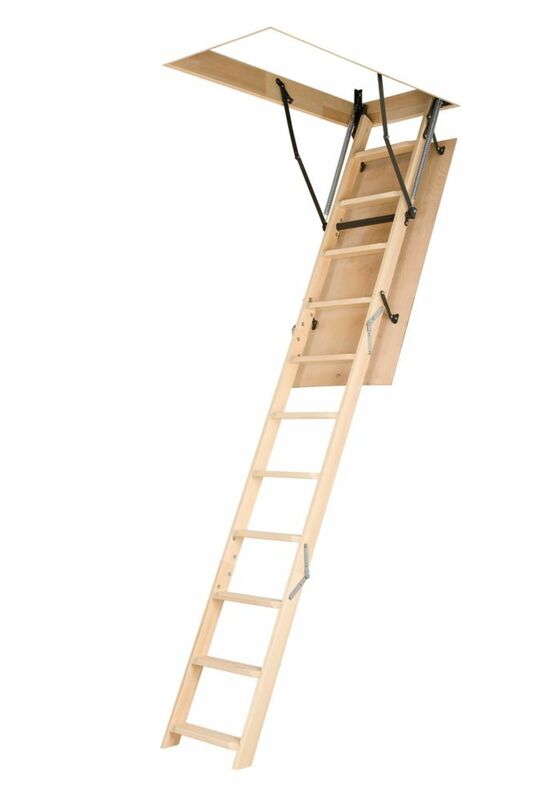 Attic Ladder (Wooden Basic) LWN 25x54 250 lbs 10 ft 1 in is rated 3.2 out of 5 by 5. Rated 5 out of 5 by HomeDepotCustomer from Very good product Product shipped quickly and picked it up at Home Depot. Easy to instal and easy to follow instructions. Rated 4 out of 5 by cj07 from Nice Construction of ladder I didn't witness the installation, but the final product is exactly what we wanted. A sturdy ladder to replace a 40 yr old one. Rated 3 out of 5 by janjack from good product for our use We just needed to replace our wooden attic stairway which was 25 yrs old. This was a good replacement, basically the same thing as what we had, only problem was that the hand rails didn't come with it although the description indicated there would be rails. We don't use the attic stairway much this seems to be an average product but if looking for something that's going to be used a lot then maybe look at other ones. Rated 1 out of 5 by handyman from Very cheap made This attic ladder is not stocked in stores, i now know why, very cheaply made. The ladder is now wider than 12 inches and the cover is made of partical board. Is there a calculation to determine what length I need for an attic ladder? Just measure your ceiling heights - the length shown beside each model is the ceiling H, not a ladder lenght.